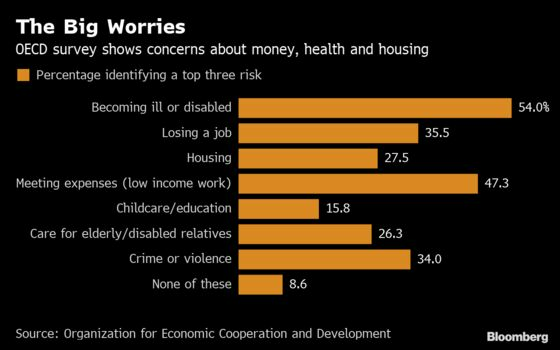 (Bloomberg) -- The people of the world’s richest economies are anxious about everything from money and taxes, to healthcare to pensions -- and they’ve little faith in their governments to do anything about it. According to a survey of 22,000 people in 21 OECD countries, there’s a “clear sense of dissatisfaction and injustice” in advanced economies. A majority believe they wouldn’t easily access benefits if needed, less than 20 percent say they get a fair share given the taxes they pay, and in many countries most people feel governments ignore their views. The OECD said the exercise in “listening to people” has produced “deeply worrying” results. For governments, the study highlights a challenging paradox: people are unhappy with social policies even as evidence shows they are living safer, healthier and longer lives thanks to those very policies. And they already spend a lot: on average more than 20 percent of economic output goes on social spending, or about $8,800 per person per year. Even within individual countries, the healthiest and wealthiest with the most opportunities are still dissatisfied. The report also shows that people do not want to roll back the state or cut down on social spending. On the contrary, they want more spending, and on average almost 40 percent say they’re willing to pay more tax to improve public-health services and pensions. That, the OECD says, means the onus is on governments to better communicate and reassure as even the prospect of job loss or poverty are enough to have damaging effects on society.